As regular and rigorous cleaning can wear away the paint finish and leave décor looking tired, Crown Trade’s market-leading Clean Extreme Stain Resistant Scrubbable paints are providing specifiers with the perfect solution to reducing maintenance requirements and helping surfaces retain that ‘just decorated’ appeal for longer. 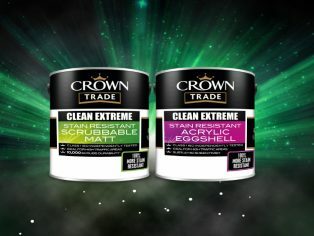 The high-performance formulation of Crown Trade’s Clean Extreme Stain Resistant Scrubbable Matt and Acrylic Eggshell offers exceptional durability, combining the dual benefits of helping to prevent stains from forming on the paint surface and being able to withstand regular cleaning by minimising the amount of paint film that is removed each time. Crown Trade’s Clean Extreme range of high performance paints has been specially developed and tested to perform in even the most challenging high-traffic environments. Based upon the ISO 11998 testing method, which is the industry standard for determining the wet scrub resistance of dry paint film, Crown Trade’s Clean Extreme Scrubbable Matt achieved a Class 1 rating and has an impressive durability level of 10,000 scrubs. This equates to a 400 per cent increase in resistance to wet scrubbing when compared to conventional matt emulsions. Crown Trade’s Clean Extreme Stain Resistant Scrubbable Matt was also recently voted ‘Best Trade Durable Matt in the Market’ by the Decorators Forum – an online hub for thousands of professional painters and decorators across the UK. As well as being exceptionally durable, Crown Trade’s Clean Extreme Scrubbable Matt and Acrylic Eggshell paints are available in a wide choice of colour options and have been developed using water-based paint technology to offer the additional benefits of being low-odour and quick-drying. 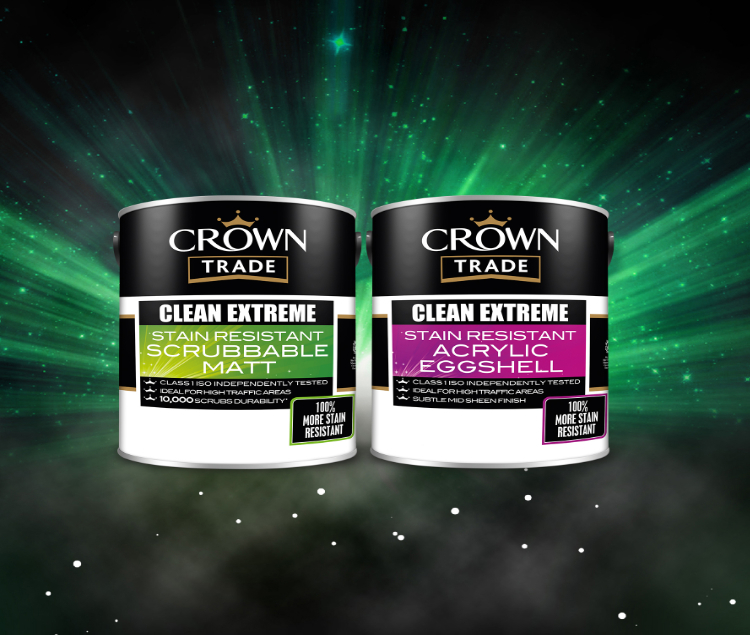 For specific problem areas, Crown Trade has also developed its Clean Extreme Anti-Bacterial and Clean Extreme Mould Inhibiting paints, both available as a high performance scrubbable matt or washable mid-sheen acrylic eggshell finish. For more information on Crown Paints’ specification services, please call 0330 024 0310, email info(Replace this parenthesis with the @ sign)crownpaintspec.co.uk or visit www.crownpaintspec.co.uk. You can also follow @CrownTradePaint on Twitter and Crown Paints on LinkedIn.